It is with great pleasure that we welcome you to experience the exciting world of MCB Visa Platinum Credit Card - a world full of surprises waiting to be explored. With our perfect combination of premier features and superior service, the enclosed rewards and recognition offer you the prestige and luxury of a lifestyle you can uniquely call your own. MCB Visa Platinum Credit Card is the most reliable, competitive and gratifying Credit Card offering a tantalizing mix of luxurious shopping, dining and traveling opportunities which will undoubtedly be a treat for you and your family. It is accepted at nearly 29 million locations in more than 150 countries around the globe and over 30,000 establishments in Pakistan. So make the most of a powerful card and expect what you deserve, a liberating experience that redefines the way you spend. Enjoy the influence of your card as you become platinum. MCB Visa Platinum Credit Card members can avail the comfort of CIP lounges at no cost at all. Just present your MCB Visa Platinum Credit Card and relax in the CIP lounge at Karachi, Lahore and Islamabad International airports. Priority Pass lets you access more than 600 airport lounges in 300 cities & 100 countries. There are free refreshments, internet usage and many other facilities a card member can use. It provides a means to get away from the hustle and bustle of crowded airports and enjoy the privileges it has to offer. The facility can be availed irrespective of the Airline or class of travel. Access to over 600 airport VIP lounges in over 100 countries and over 300 cities – so you can treat yourself like a VIP no matter where you travel, or which airline and class you fly. Peace and quiet – relax and unwind away from the chaos of the airport, and enjoy a range of complimentary refreshments. Full business facilities – most lounges offer phone, fax, email and internet facilities, some even have conference rooms. Excellent value for money – three membership plans designed to offer you VIP airport lounge access at competitive rates no matter how frequently you travel. Locate the Priority Pass lounge you want to visit. Present your MCB Priority Pass to the reception. You will be asked to sign a Record of Visit Voucher. In some lounges your card will electronically be swiped. MCB Visa Platinum cardholders would be entitled to get triple reward points on international spend! MCB Visa Platinum cardholders will get 5% cash back on international lodging while spending on their card! Rs.8K per annum Cap on the cash back. MCB Visa Platinum cardholders will get 20% cash back on selected local restaurants while spending on their card! Enjoy round-the-clock access to the Visa Platinum Customer Centre. Services such as organizing a flight to Paris, recommending a restaurant in Hong Kong, arranging for opera tickets in Milan or even suggesting a reliable dry cleaner away from home are just some of the services available. All it takes is a phone call or a mouse click, any time anywhere in the world. To avail the facilities please dial 0080090044051. MCB Visa Platinum cardholders will get exclusive discounts at the following partner’s outlets while using their platinum card! 10% Discount on Minimum Spend of Rs. 25,000/- on Non Grocery Items. Cash Back amount will be reflected into next month’s bill statement Rs, 2,000/- per month cap on the cash back. When you revolve markup rate on previous months retail transactions reduce every month upto 6 months. Thus the older your retail transactions, the lower the markup rate. Keep revolving with the peace of mind that you are paying a declining markup rate. If you have not already subscribed for i-revolve at the time of filling your MCB Visa Platinum Credit Card application, contact our Call Center at 0800-622-72. Your chosen option will be effective from your next billing cycle. You can choose between i-revolve and fixed mark-up by contacting our Call Center. 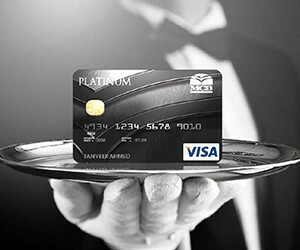 Use your MCB Visa Platinum Credit Card to revolve and pay less as you become Platinum. Note: APR and other associated charges are mentioned in the Schedule of Charges. All MCB Visa Platinum Credit Cards come activated with the i-secure feature. It offers you added convenience and absolute safety and security so that the next time you shop, it is without the fear of Credit Card scam or misuse. An embedded chip makes MCB Visa Platinum Credit Card technologically advanced and efficient, plus gives the capability of storing large amounts of intelligent encrypted data. You are protected against fraudulent transactions on your Card, making it a highly secure and an effective mode of payment. Your Card uses cutting edge encryption methods to operate, thus preventing all forms of physical fraud related to your Card such as skimming and counterfeiting. This feature is automatically activated in MCB Visa Platinum Credit Card. Pay with ease and convenience by adopting any of the following payment channels. Cash Payment through MCB Branches. Cheque Payment Drop Box Facility at MCB Branches. Direct Debit Facility from MCB Bank Account. Payment through Virtual Banking for MCB Bank customers. Payment through Mobile Banking for MCB Bank customers. Payment through IVR by calling our Call Center for MCB Bank customers. Pay back in easy equal monthly payments in tenures of 3, 6, 12, 18, 24, 30 or 36 months. Call our Call Center on 0800-622-72 to avail this facility. *Minimum amount transferred should be PKR 3000 or above and within your available credit limit. Have a payorder delivered within 3 days to your billing address. Pay back in easy, equal monthly installments of 3, 6, 12, 18, 24, 30 or 36 months. Just contact our Call Center at 0800-622-72 and have a payorder made today. Just contact our Call Center at 111-000-MCB (622) and have a pay order made today. Convert any retail transaction of PKR 3000 or more in easy equal monthly payments at lower markup rate. Select payment tenures of 3, 6, 12, 18, 24, 30 or 36 months. Contact our 24 hour Call Center at 0800-622-72 to convert that transaction onto i-plan. Only valid for retail transactions not more than a month old. MCB Visa Platinum Credit Card with i-insure gives you the most flexible and comprehensive options to cover your family and yourself against contingencies. And that too by just paying a very nominal monthly premium for your chosen insurance plan. Fraudulent Credit Card Transactions:Theft or robbery incurred by transactions done fraudulently on your Card. A cover of upto PKR 40,000 is provided under this option. Loss of Identification Documents:Government of Pakistan Identification Papers like Passport, CNIC, Driving License, etc. Covers your family in case of your unforeseen accidental death while traveling in a Common Carrier (commercial airline, railway, water borne or passenger bus). Covers your family in case of an unfortunate event resulting in your death or disability. Your children's education cost will be taken care of in case of an unfortunate event resulting in your accidental death or disability. Covers your family in case of unforeseen event of your accidental death or disability. In case of an injury, illness or death, the outstanding balance on your MCB Visa Platinum Credit Card is insured for payment and costs a nominal percentage (as per the Schedule of Charges) of your outstanding balance. You can also avail Wallet Protection as a separate insurance to sign up for the package of your choice. On death of the insured Cardmember by any cause, the benefit will be the amount of the indebtedness plus the credit charges on the indebtedness for the maximum period of two months after the date of death. In the event of Temporary Total Disability due to accident or sickness, the benefit will be the continuation of the minimum monthly payment during the disability period. Temporary total disability means disability caused by accident or sickness and as a result of which the Cardholder is unable to be engaged in his own usual occupation for a period exceeding 45 days. No benefit is payable during the 45 days waiting period. On Permanent Total Disability of the Card member due to accident or sickness, the Benefit will be the amount of indebtedness. The benefit will be paid after 6 consecutive months of total disability. Permanent Total Disability means inability of the Cardholder to engage in any occupation for which he is reasonably qualified by education, training and experience. Benefit will become payable 6 months after the onset of disability. If a card member is diagnosed with a terminal illness the amount of indebtedness plus credit charges for the maximum period of two months will be payable. Terminal illness means illness, which reduces expected lifespan of the card to less than 6 months as certified by an approved physician. A set of income for card holder's family for the years to come. In the event of any mishap (Natural or accidental) or Total and permanent disability the beneficiary shall receive the monthly sum assured of Rs. 10,000/- on a monthly basis for 10 years. MCB Visa Platinum Credit Card comes activated with the i-cash feature enabling you to withdraw upto 75% of your credit limit. All you need to have is your MCB Visa Platinum Credit Card and your unique Personal Identification Number (PIN). Insert your Card into any Automated Teller Machine (ATM) in Pakistan or abroad which displays a Visa logo indicating that your Card is accepted and just follow the simple instructions. Withdraw up to 75% of your credit limit by visiting any of the following designated branches of MCB Bank and charging the card on POS Machine. MCB Visa Platinum takes care of your immediate cash needs...anywhere and everywhere! MCB Bank Cardholders can now pay their utility bills through their MCB Platinum Visa Credit Card. You can choose from options for a one time payment as well as recurring automatic payments. MCB Visa Platinum Credit Cardmembers can enroll for Mobilink Auto Debit and billing on your card. To enroll simply call at 111-000-MCB (622) and register for this facility. MCB Visa Platinum Credit Card members can enroll for club bill payment and billing of the same on their card simply by calling our 24 hour call center. To enroll simply call at 111-000-MCB (622) and register for this facility. Any transaction is done using MCB Visa Platinum Credit Card. Payments are made for an outstanding amount against MCB Visa Platinum Credit Card. A Mini statement is generated (once a month). New promotional offers are introduced on MCB Visa Platinum Credit Card & much more. You can redeem your reward points for any product of your choice from the I Shop catalogue. Redeem MCB Bank reward points in exchange for a product from the i-shop catalogue. Shop instantly by charging on MCB Visa Platinum. Shop by converting the purchase price into an i-plan with 0% markup payable in 6 months. Please contact our 24 hour Call Center at 111-000-MCB (622) to book your order. The i-plan option will allow you to purchase products valued at PKR. 3000/- and above and pay back in 6 equal monthly instalments at 0% markup. The redemption option will allow you to redeem your reward points in exchange for a product from the i-shop catalogue. The purchase price option will allow you to conduct a phone order transaction and authorize a one time charge for the cost of the product to be charged on to your MCB Platinum Credit Card. * The Prices mentioned above are initial prices and are subject to change. For updated prices customers have to call our call center at 111-000-622. Priority Pass is the world’s largest independent airport VIP lounge program. Now bigger and better than ever with more than 600 lounges throughout the world! In over 100 countries and over 300 cities – so you can treat yourself like a VIP no matter where you travel, or which airline and class you fly. Relax and unwind away from the chaos of the airport, and enjoy a range of complimentary refreshments. Most lounges offer phone, fax, email and internet facilities, some even have conference rooms. Three membership plans designed to offer you VIP airport lounge access at competitive rates no matter how frequently you travel.